Sticky-sweet rice with mango, also known as "khao neeo mamuang". Sitting here in my bedroom late at night, I can't help but feel so hungry for something that I just simply can't readily get here in Pullman. The only way I can actually get it is either in Seattle or find the ingredients and make it myself (which I will probably do when I have time). 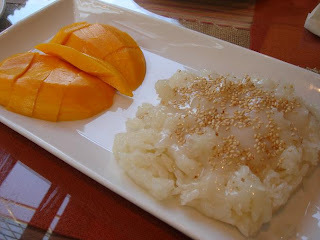 What I am talking about here is khao neeo mamuang, also known as "sticky-sweet rice with mango". As the name itself implies, the Thai dessert basically consists of sticky-sweet rice covered in coconut milk and toasted sesame seeds served alongside fresh and riped slices of mango (can be Thai or Brazilian mangoes found at Asian markets). It's simply the most popular Thai dessert and everyone eats it all the time. Eating khao neeo mamuang at a restaraunt. Seriously, this is what I'm craving for. I've been eating it all my life since my mom makes it all the time, especially during summer when she has much more free time on her hand. Since the years I've no longer been living with my mom, the only time I've ever had the chance to eat khao neeo mamuang is either when I'm dining at a good Thai restaurant in bigger cities or when I make a trip and visit my parents and relatives elsewhere. For me, I love sweet sticky rice so much as if there's no tomorrow and for now I've somewhat grown accustom to and accepted the fact that I can live without it for a while. However, tonight I sense that this tolerance can no longer be handled patiently and I MUST have some right now. If I had the ingredients, I would totally make some right now even though it's 2:50 AM. Thank goodness I'm heading down to San Antonio this Christmas! I simply cannot wait to have my mom make some for us. In the meantime, I found a good recipe on how to make khao neeo mamuang right here. Yum!...I want some! Will you make me some if you ever come up to Vancouver???! haha...sure, if you treat me out to sushi like back in summer, hell yeah!